For 'SNL' Cast Member, The Waiting Was The Hardest Part After years of working at a restaurant by day and performing improv comedy by night, Bobby Moynihan got the opportunity of a lifetime: an audition for Saturday Night Live. But as Moynihan recalls, actually getting his 'big break' on the show was much more difficult. Bobby Moynihan (left) appears on Saturday Night Live as the character "Drunk Uncle." As part of a new series called "My Big Break," All Things Considered is collecting stories of triumph, big and small. These are the moments when everything seems to click and people leap forward into their careers. For about a decade, Bobby Moynihan lived a double life. By day, Moynihan says, he tended bar at a Pizzeria Uno in New York. By night, he performed improv comedy at the Upright Citizens Brigade Theatre. But he says he always had one dream: to join the cast of Saturday Night Live. After years of performing at the UCB Theatre, Moynihan caught the attention of producers at SNL, who invited him to audition. "I was absolutely terrified," he tells All Things Considered, "but elated, because that's all that I've ever wanted to do." Moynihan is now a cast member, known for his characters such as "Drunk Uncle" and his impressions of people like celebrity restaurateur Guy Fieri. But Moynihan says the call to audition for SNL prompted a mix of emotions. "It's like the equivalent of, 'Hey, you're gonna go to space,' " he says. "It's like, 'Yeah that's a great idea, I would love to go to space, but it's really dangerous and terrifying up there.' "
But the road to his big break involved a lot of waiting. First, there was the four-hour wait in the dressing room ahead of the audition. Then, after the audition, there was the nine-hour wait outside the office of Lorne Michaels, the creator and executive producer of SNL. But after that promising meeting, in which Moynihan thought he had a good shot at the job, came the hardest wait of all. In November 2007, the Writers Guild of America went on strike for several months, which put SNL production on hold, and left Moynihan on the hook. 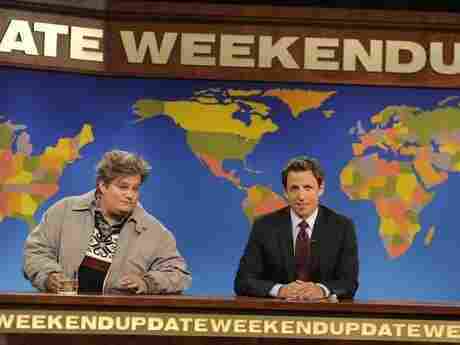 When the strike finally ended in early 2008, Moynihan got a call from SNL. But it wasn't with good news. "They told me that [then-cast member] Maya Rudolph had had a baby during the break, so they had to hire a woman instead [as a replacement]," says Moynihan. Eventually, after a few movie roles, Moynihan had an opportunity to audition for a second time. "When it was all over," he says, "I was more relieved, because it had been like a 14-month process." During the long interim period, Moynihan says he had moved back to his hometown, into an apartment across the street from his mother's office. He was sleeping when he got the call he was waiting for from Lorne Michaels. He would become a cast member on SNL. Moynihan says he couldn't wait to tell his mom about his big break. "I ran across the street [to his mother's office] in boxers and a T-shirt — didn't even think to put pants on — and ran across the street to my mom and told her that my life's dream had come true."